Since being named Capital of Culture in 2008, Liverpool has been an area of continual growth and development over the last decade. There have been numerous, significant developments in the city centre, including Liverpool One, Mann Island, Princes Dock and the Echo Arena and Convention Centre, encouraging tourists from all over the world to take advantage of the exciting city life that Liverpool possesses. These developments have created vibrant environments not only for tourists, but for those people living and working in Liverpool City Centre and its surrounding areas. I recently attended the Liverpool BID Company’s, “BID High Street Forum”. The forum was established to provide a voice to businesses in Liverpool, creating a place where anyone can find out about upcoming developments, planned by the Liverpool BID Company. The areas of Liverpool City Centre that were focused on by those leading the forum were Brownlow Hill, The Strand and Canning Dock. Their plans are to spend almost a quarter of a billion pounds to modernise these areas, pedestrianising them so that footfall increases and traffic decreases, encouraging a greener Liverpool. The Liverpool BID Company’s plan for the Canning Dock is to connect Mann Island to The Pumphouse on the borders of Albert Dock with footbridges, making the entirety of the dock more accessible to pedestrians, enabling them to walk from the Echo Arena towards Liverpool’s restaurants, hotels and bars without having to negotiate The Strand’s 4 lanes of traffic. The proposed plans, particularly on The Strand and on Brownlow Hill, are to decrease the number of highway lanes and increasing the pavement areas to encourage more pedestrians and accessibility to businesses in the area. These plans understandably caused concern with particular individuals who were attending the forum. Business owners who organised coach tours were particularly concerned with how their businesses would survive if highway lanes were reduced on the strand, questioning where they would park their coaches if Liverpool BID Company’s plans were to go ahead. Others who attended the forum were also concerned about their daily commute. This also concerned me, as rush hour on The Strand is already difficult when there are 4 lanes, never mind 2 or 3 to accommodate more pedestrians in the area. On the other hand, removing my personal opinions from the matter, I can appreciate what the Liverpool BID Company is trying to achieve. Their plans encourage people to be a pedestrian in Liverpool, to make use of public transport and to make the city a greener environment. 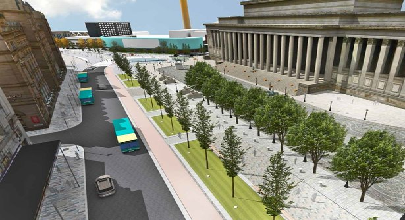 Their plans to regenerate areas like The Strand, Canning Dock and particularly the area in front of Lime Street Station will make Liverpool an even greater place to live or visit and make the city more presentable to all of its inhabitants and visitors. My personal understanding of what the Liverpool BID Company is planning is that it would be fantastic if it worked, but for it to work, it requires a large portion of Liverpool’s population to think, “They’re right, I will take the train to work”, which is something I believe is a lot easier said, than done. What do you think? Would you like to see Liverpool pedestrianised? Or, do you think this will hinder your day-to-day routine in Liverpool City Centre? Let us know in the thoughts!